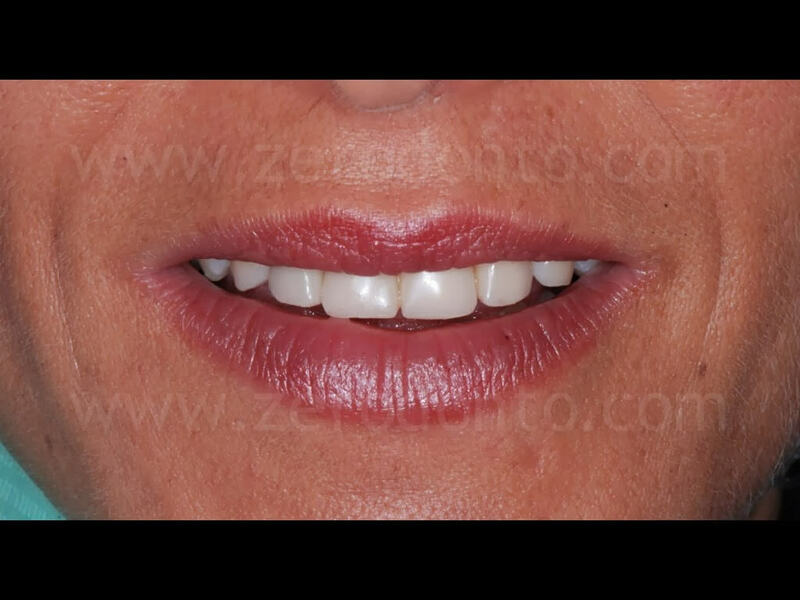 A 42 year-old female patient, unsatisfied by the esthetics of her smile, asked for the rehabilitation of the maxillary incisors by means of fixed prostheses, substituting 4 previous metal-ceramic single crowns. 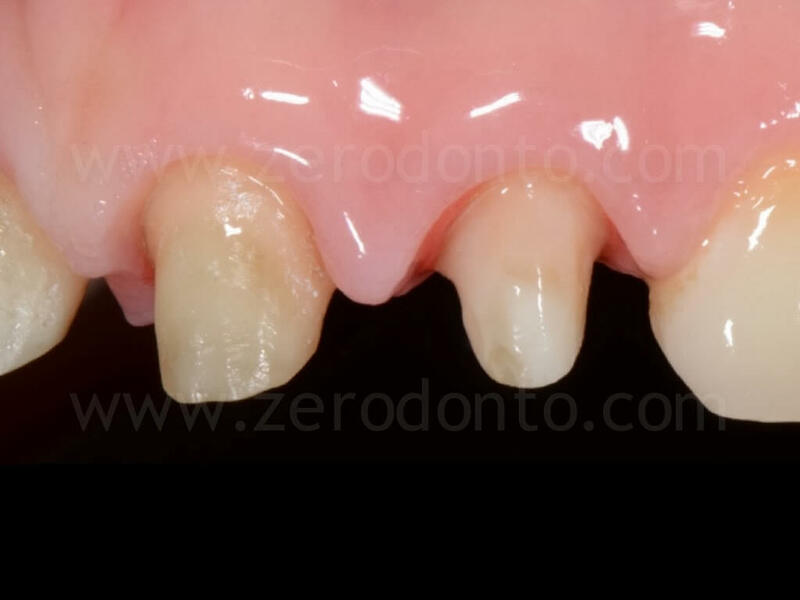 After the study of the case and the routinary clinical and laboratory analyses, the previous restorations were removed and the preparations of the abutment teeth were revised, making 1 mm circumferential chamfers. 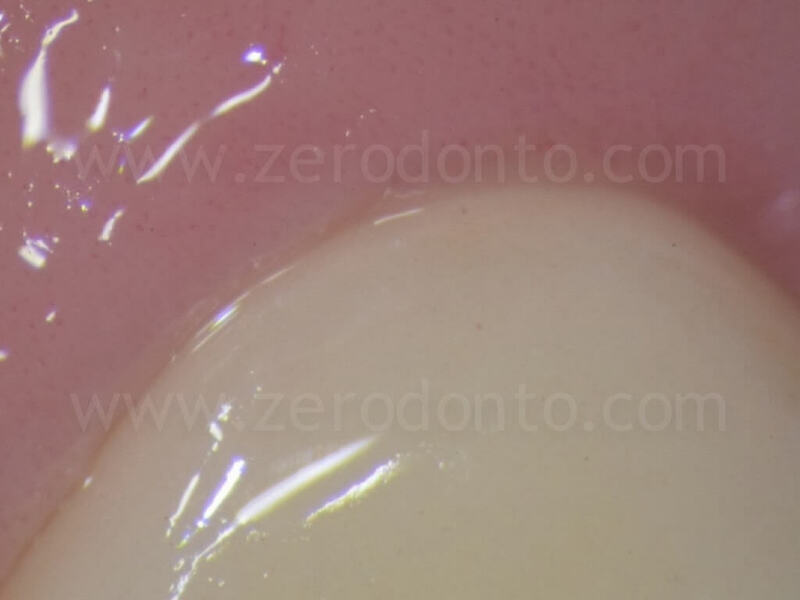 The periodontal tissues were conditioned to a healthy state using a temporary fixed acrylic resin prosthesis, that was relined so as to make the gingival tissues properly scalloped. 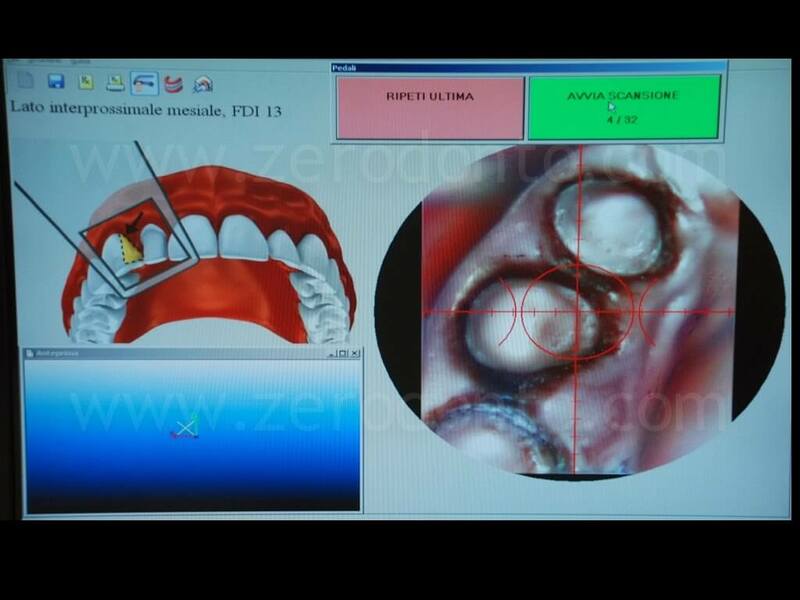 – optical impression using the Itero intraoral scanning system. 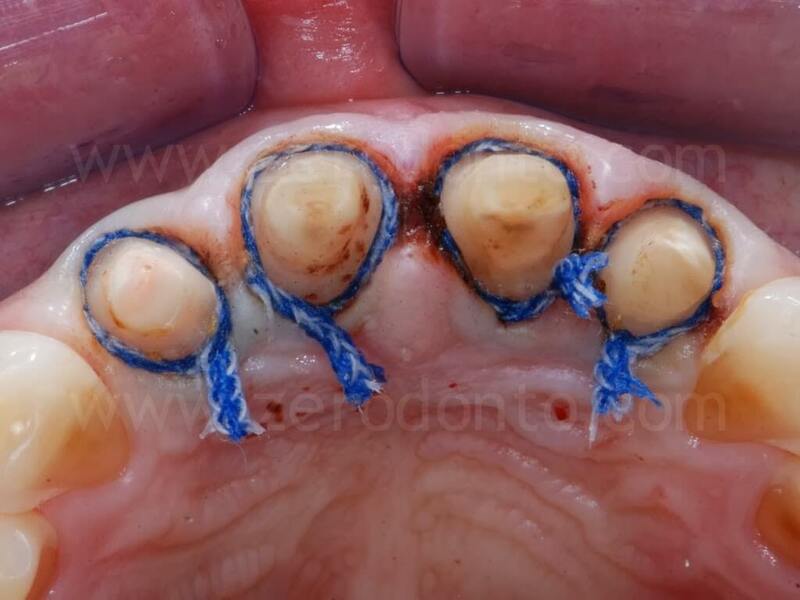 As to the conventional impression technique, the gingival tissues were displaced using two retraction cords; a #000 and a #2 cords were used to displace vertically and horizontally respectively the marginal tissues. 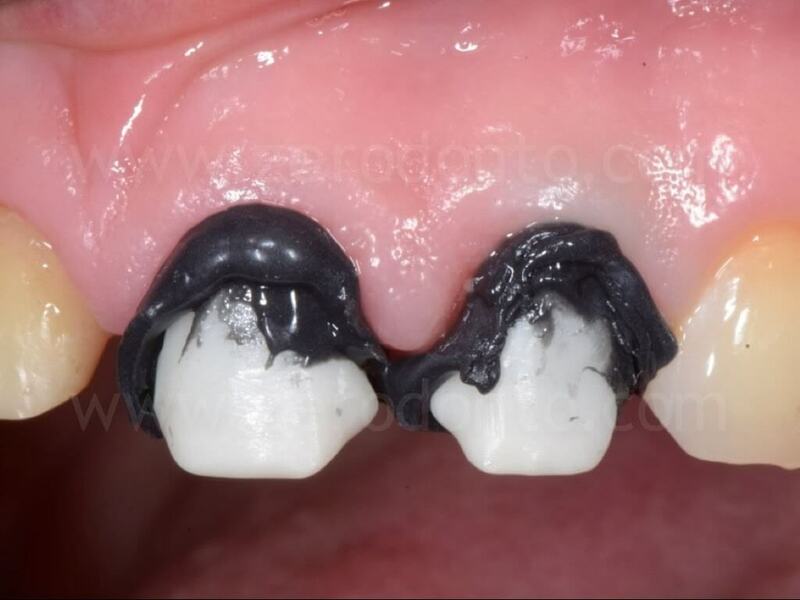 The second cord was dipped in a 20% ferric sulfate astringent solution to improve hemostasis. 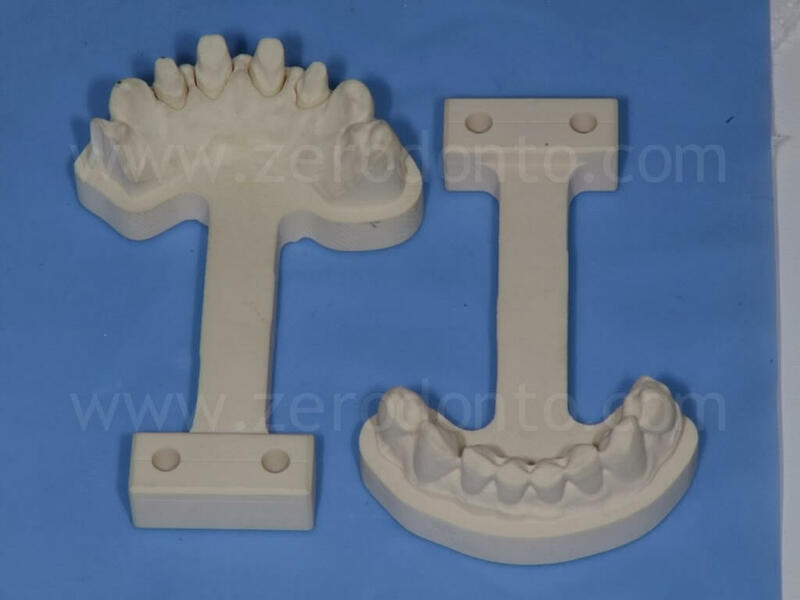 Then, a conventional one-step two-phase precision impression was taken, using medium- and light-consistency polyether impression materials. 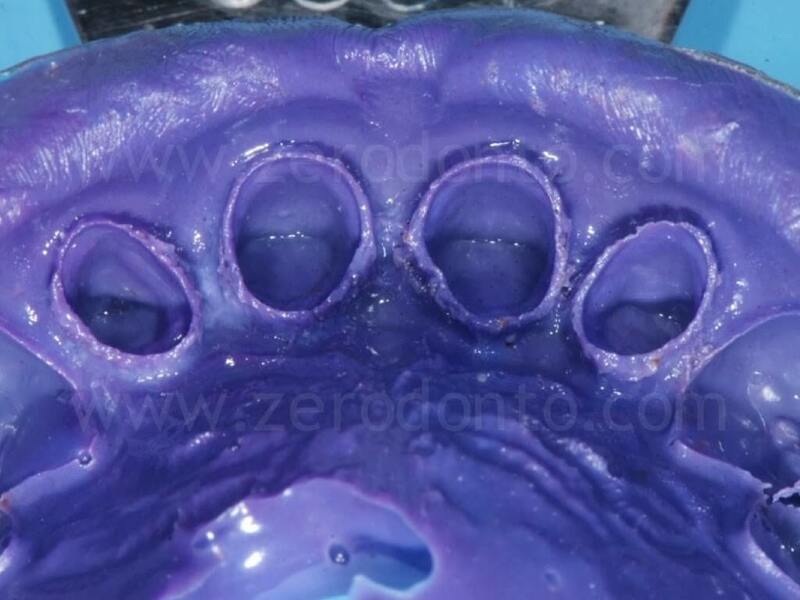 The master cast was poured with class IV extra-hard stone and then it was duplicated. 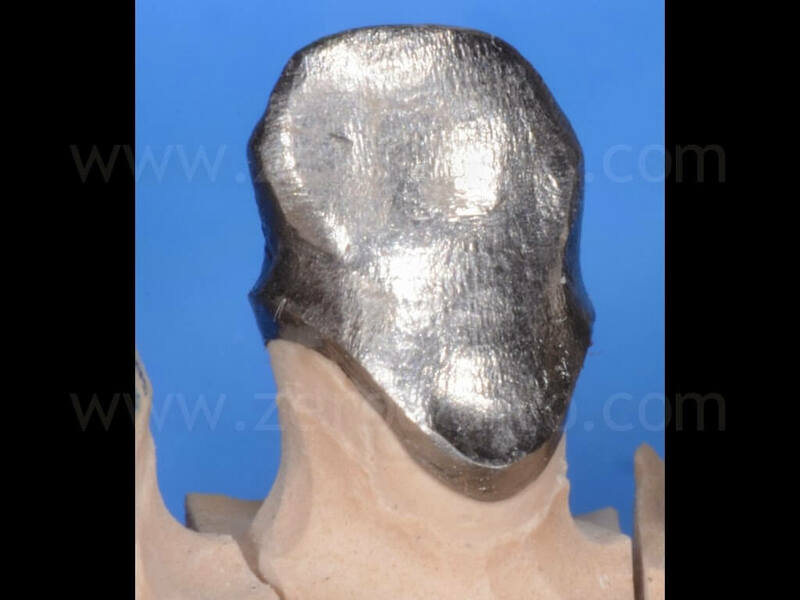 With a merely speculative purpose, such a conventional impression was taken to compare the operative procedures with those of the optical impression, as well as to fabricate four gold alloy single frameworks, in order to relate the marginal and internal values of precision of fit with those achieved with zirconia cores fabricated using the optical impression workflow. 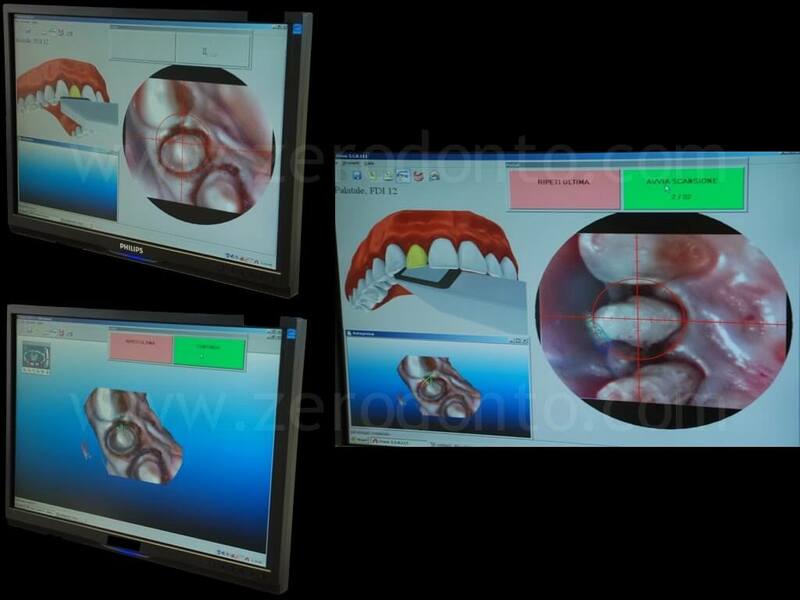 As regards the digital impression, the Itero intraoral scanning system was used. 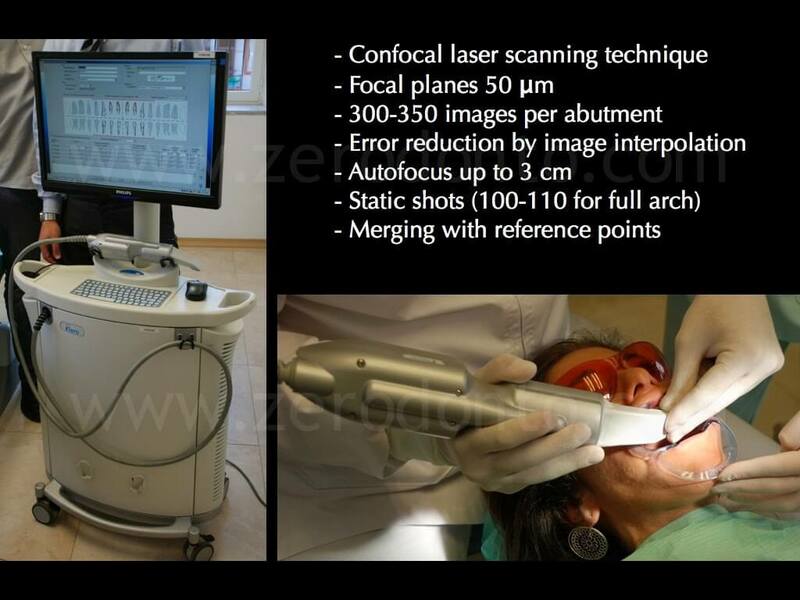 This system is based on a confocal laser scanning technique with focal planes at 50 microns, it records 300-350 images per abutment and it is provided with autofocus up to 3 cm. About 100-110 static shots per arch are taken and then they are merged by means of specific reference points identified by the software, which is able to reduce the mean error interpolating the images. 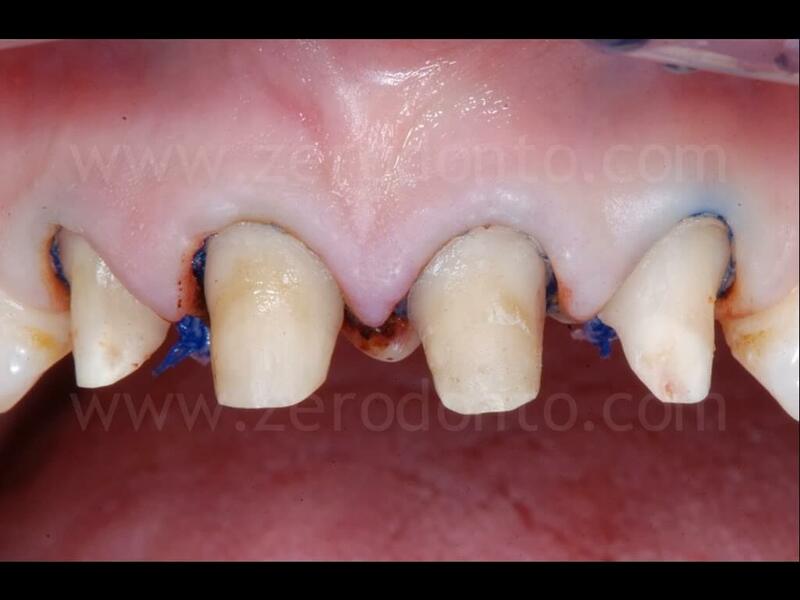 The gingival tissues were displaced using a single #2 retraction cord without any astringent agent. 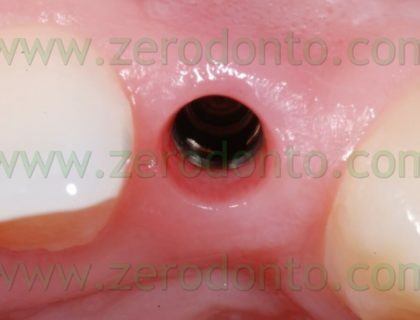 Subsequently, an optical impression was taken using the Itero system and a dedicated intraoral scanner. 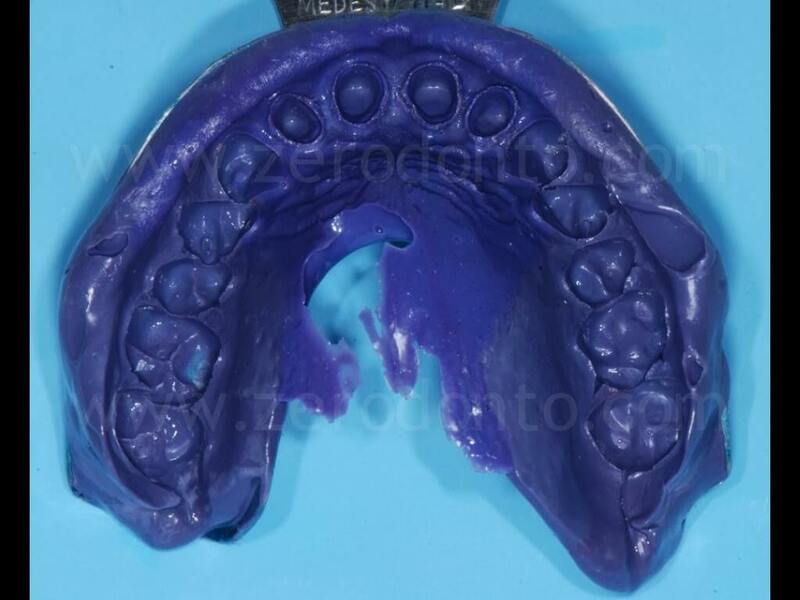 The impression procedure suggested by the software was followed: after gently removing each retraction cord, the three-dimensional morphology of each abutment was recorded. 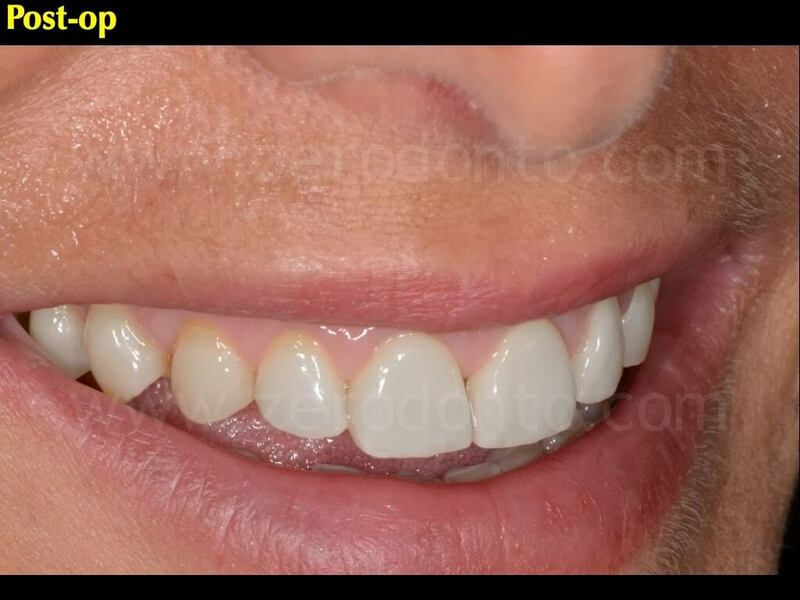 The image was taken as soon as the software interpolated correctly each abutment surface. 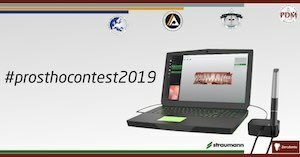 Moreover, the system needed to record the morphology of the teeth adjacent to the abutments (2 per each emiarch) as well as of the antagonist teeth, in order to acquire the occlusal reference points necessary to the CAD phase. 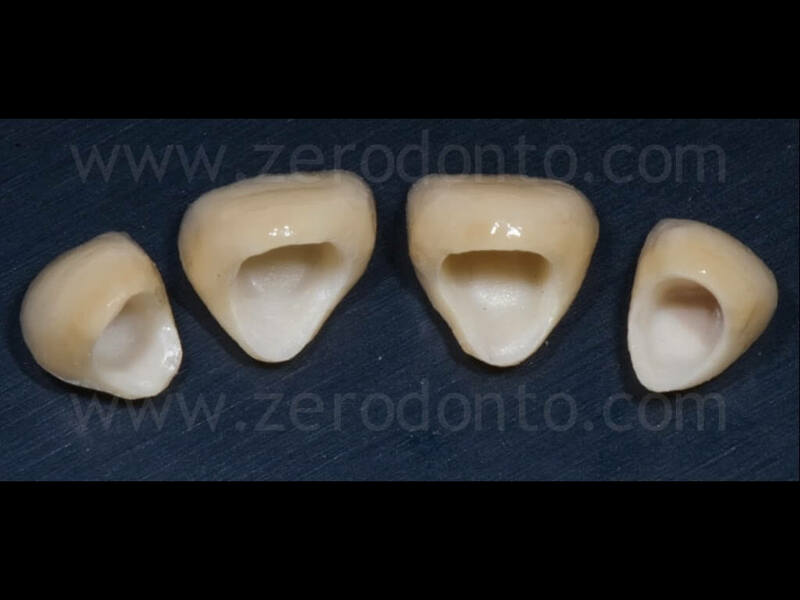 Four gold alloy single frameworks were fabricated from the stone master cast poured from the conventional impression, according to the traditional lost wax technique. 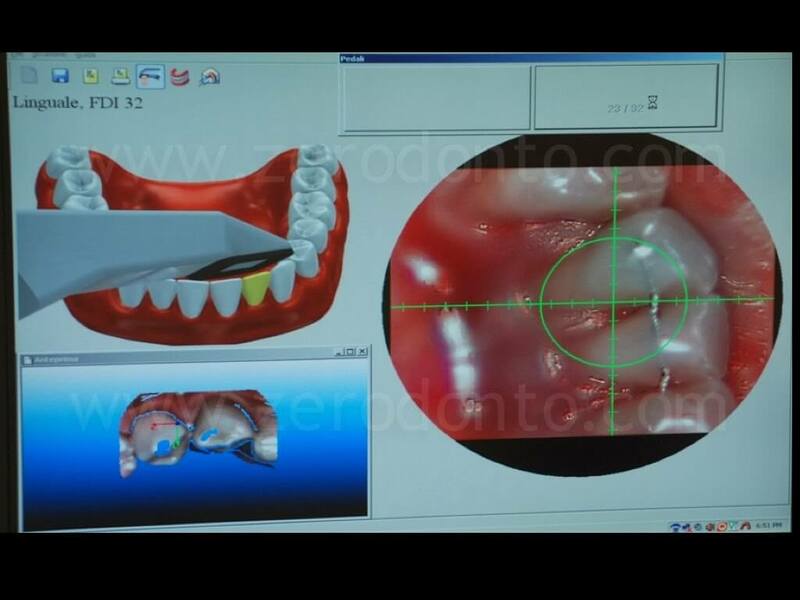 Differently, a stereolitographic working model of the scanned area was obtained from the digital impression. 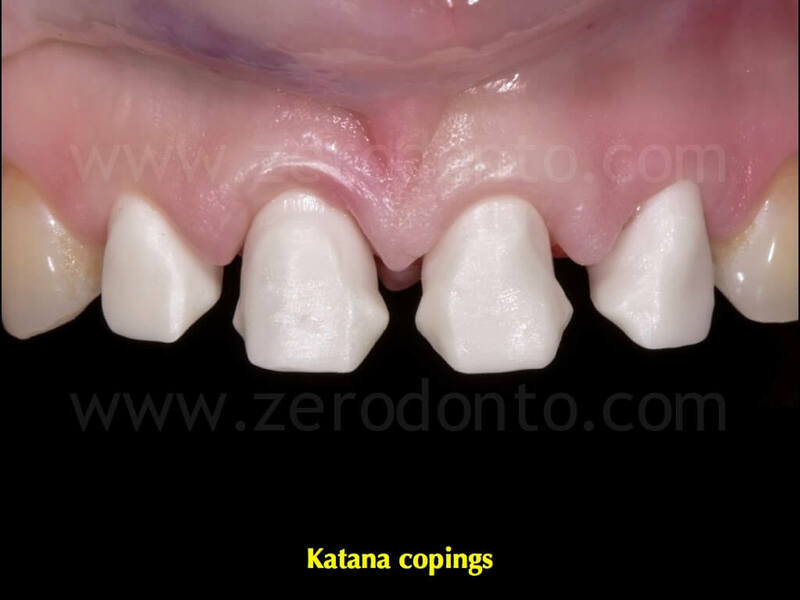 Then, two sets of zirconia single cores with a thickness of 0.5 mm were produced: one set was automatically modelled by the Cares software (Straumann) while the other one was anatomically modeled using the Katana system (Noritake). 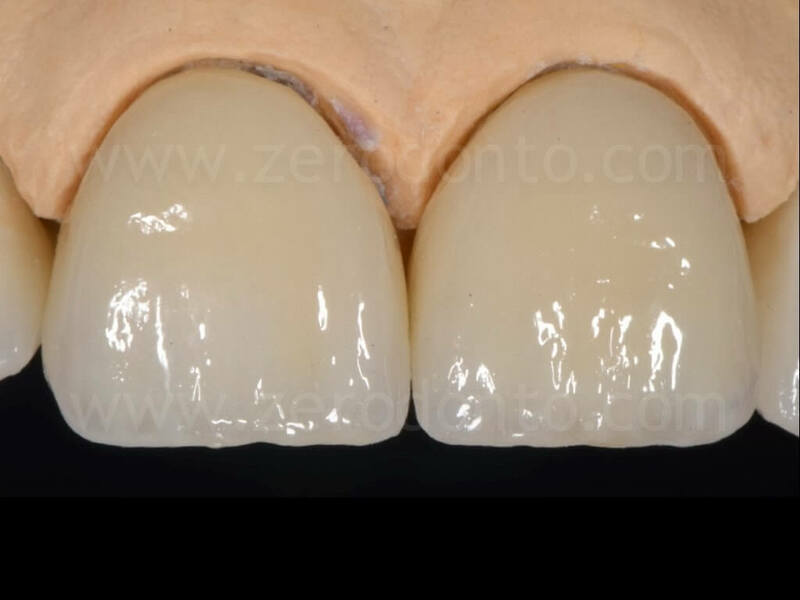 The fit of the frameworks was checked intraorally using a white silicon disclosing agent inside the metal copings and a black one in the zirconia cores, so as to highlight any pressure spot on the internal surface of each crown. 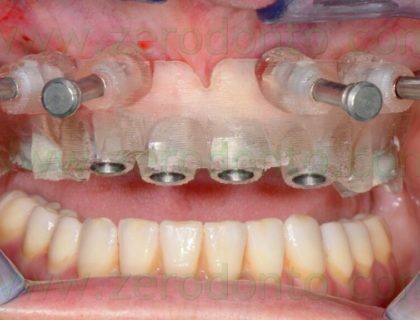 In all systems, the passive fit was considered clinically optimal. 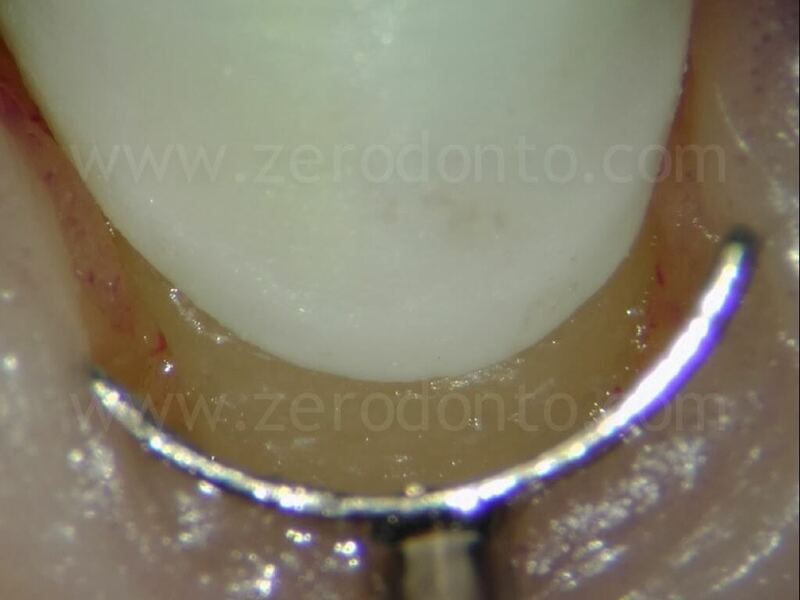 Then, the marginal precision of each coping was checked using a stereomicroscope (30x), gently displacing the marginal tissues apically by means of metal anatomical gingival divaricators. In all systems no clinically relevant marginal misfit was noticed. 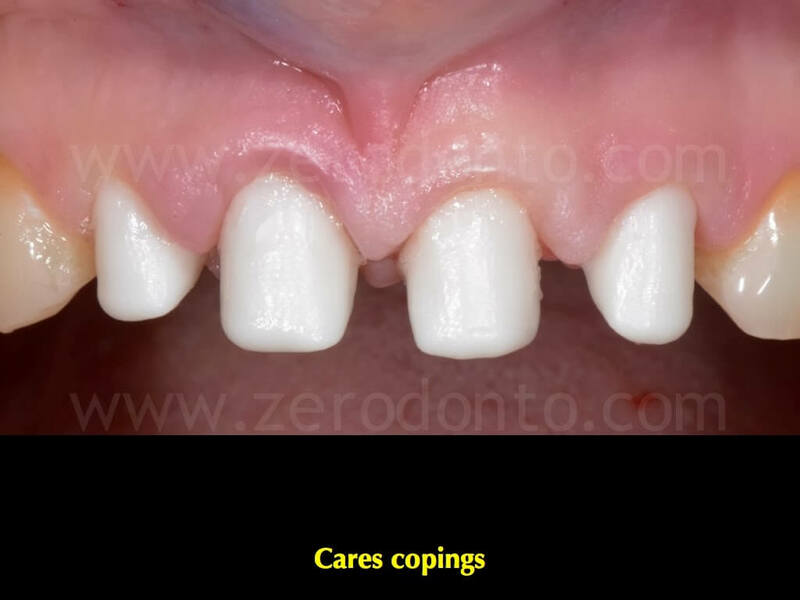 Both sets of zirconia copings were veneered by means of dedicated ceramics; after the intraoral tryin, the esthetic evaluation was made in accordance with the patient. 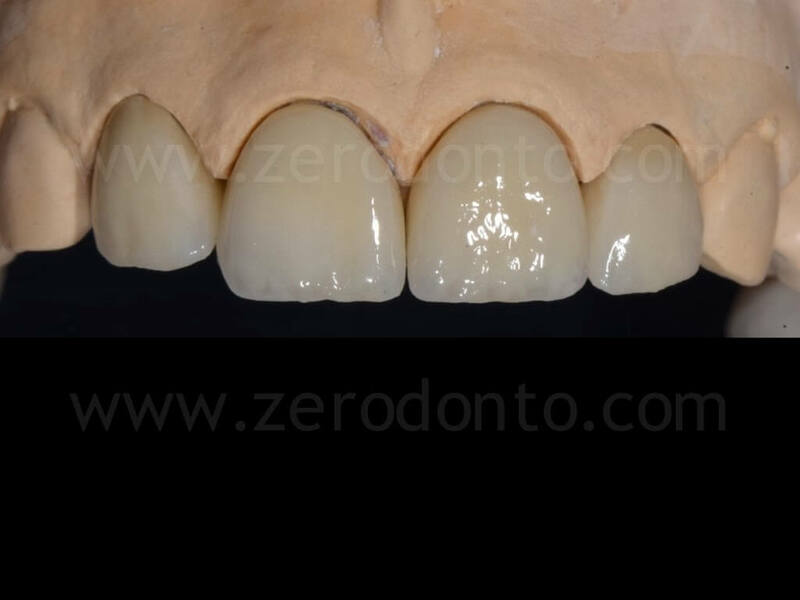 Finally, it was decided to cement the zirconia-ceramic single crowns fabricated with the Katana system using a resin luting agent. 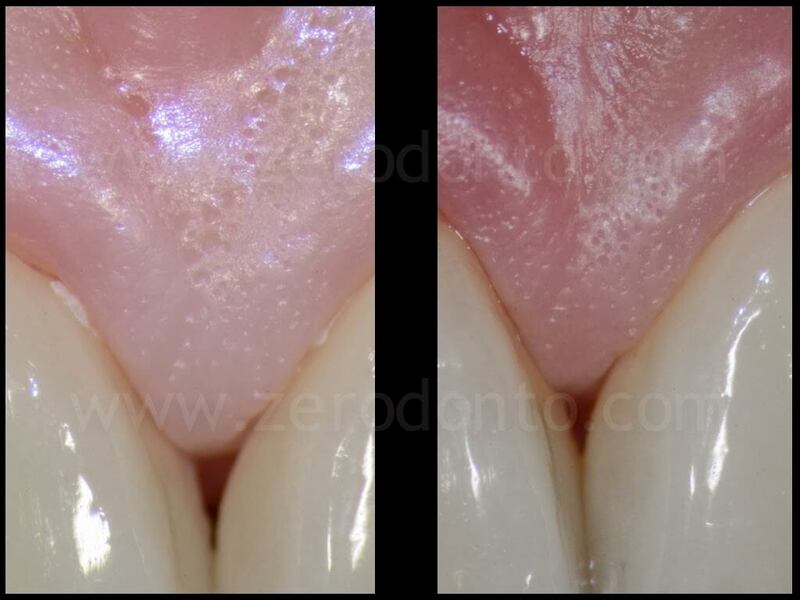 The cement excesses were carefully removed using teflon tips on a sonic handpiece under a stereomicroscope, so as not to wound the gingival tissues. 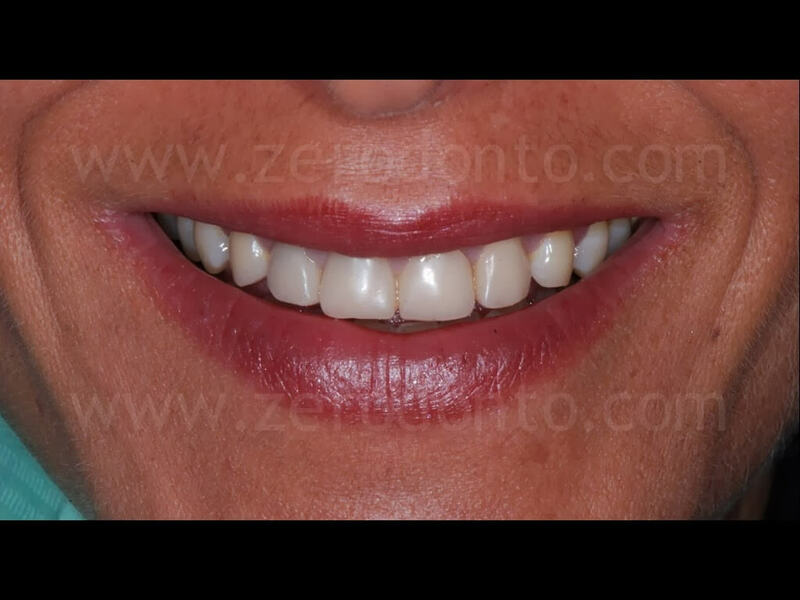 The occlusal contacts were carefully checked and balanced both in centric occlusion and in lateral and protrusive movements. 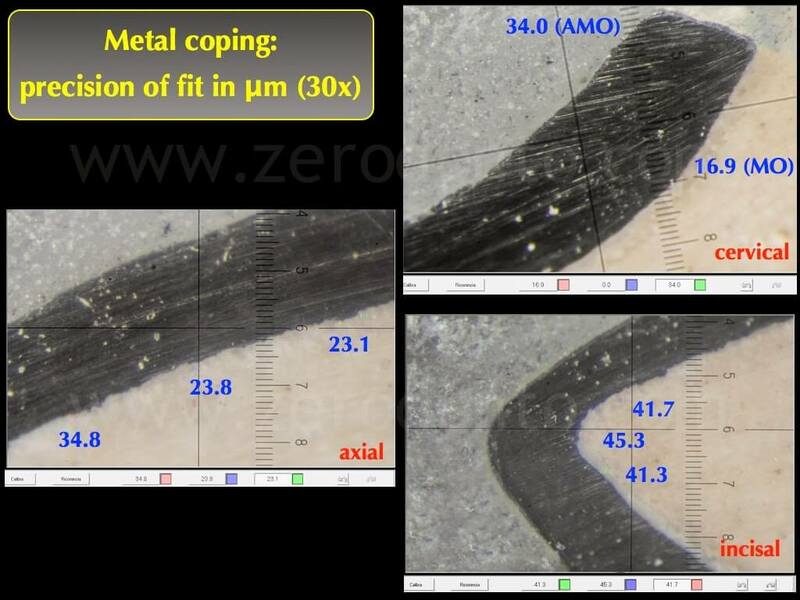 The marginal precision and internal fit of both the metal (considered in the literature as the gold standard for marginal fit) and the zirconia cores were checked by means of a stereomicroscopical analysis (40x) of the longitudinal section of each coping. 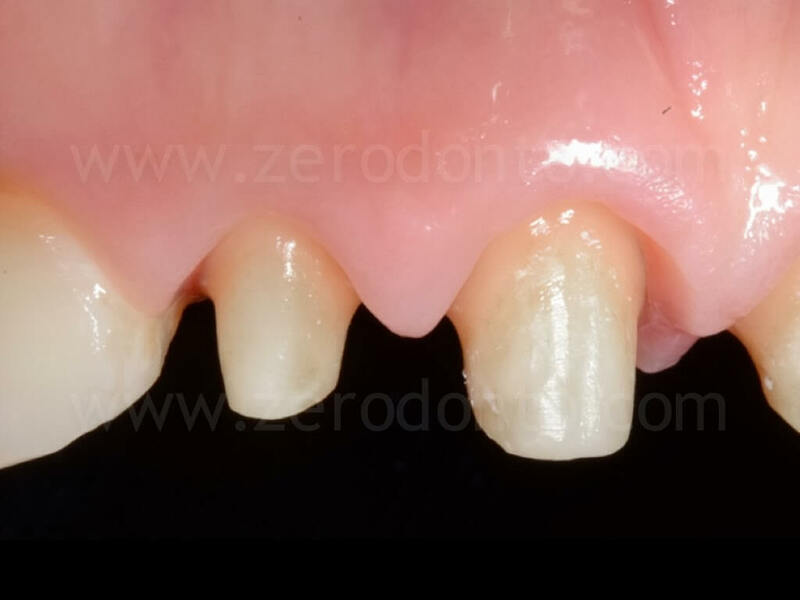 Consequently, both the sets of zirconia frameworks were duplicated using the same files: a first set was veneered for the subsequent clinical procedures while a second one was used to fabricate the specimens to be sectioned. Viceversa, the metal cores were not duplicated, since they had not to be veneered. 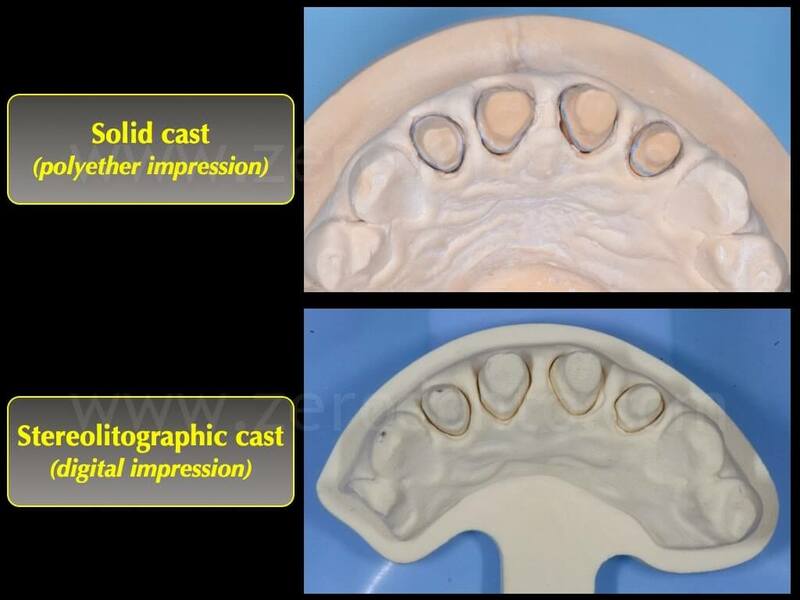 Within the limits due to the absence of a reference metal master cast, the present clinical study was performed to verify the in vivo precision of prosthetic single crowns; thus, it was necessary to seat each coping on the relative working model. 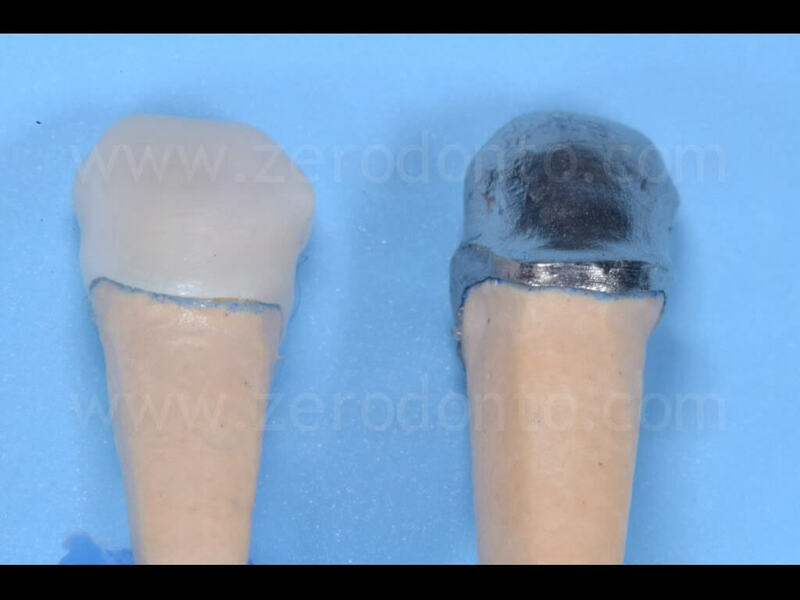 The metal frameworks were cemented using a zinc-phosphate cement while the zirconia cores were luted with the same resin cement used for the clinical cementation of the crowns. 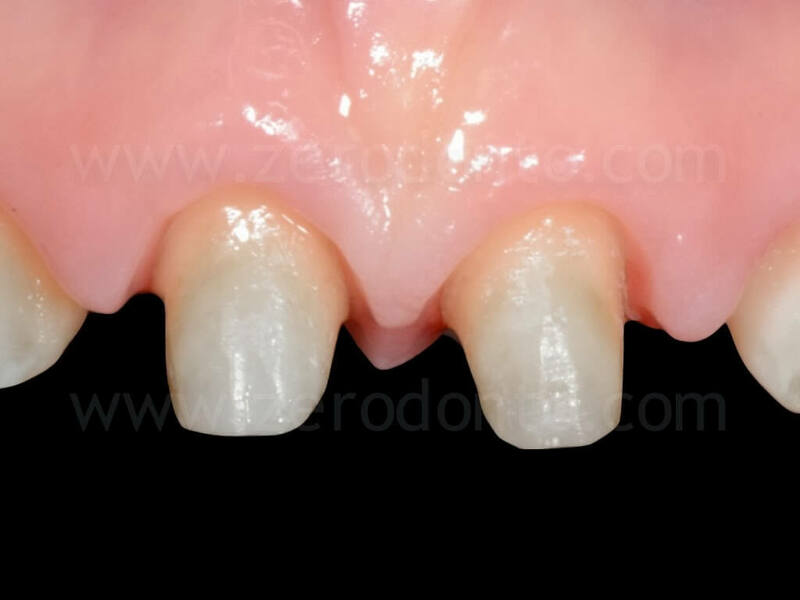 Then, each coping was embedded in resin blocks and the longitudinal sections of the cores were made, in order to evaluate the marginal and internal precision of fit of the frameworks. 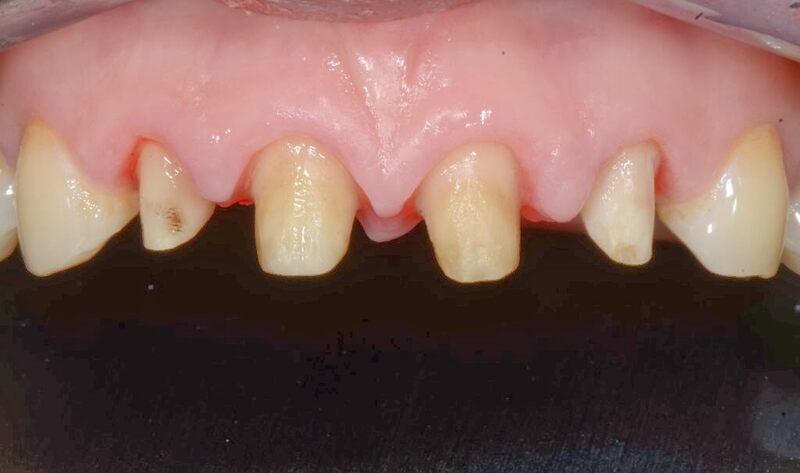 The cut was made along the longitudinal axis of the tooth, from the middle area of the buccal cervical convexity to the middle area of the incisal margin. 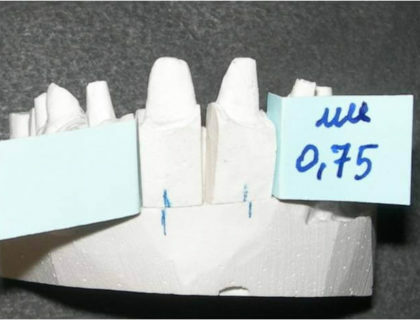 Finally, the measurements of the marginal precision at the finish line (MO: Marginal Opening, AMO: Absolute Marginal Opening) and of the internal fit in the axial (coronal, mid, incisal) and incisal areas (buccal, mid, palatal) were made using a point-to-point micrometric measuring software. 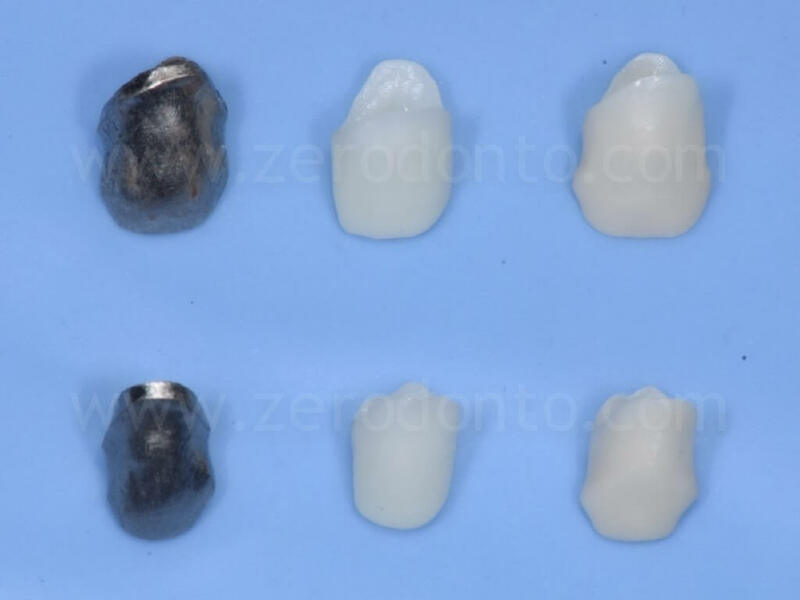 Accordingly to literature data, the metal frameworks showed lower marginal gaps (16.9 microns) than the zirconia copings (21.1-28.4 microns). 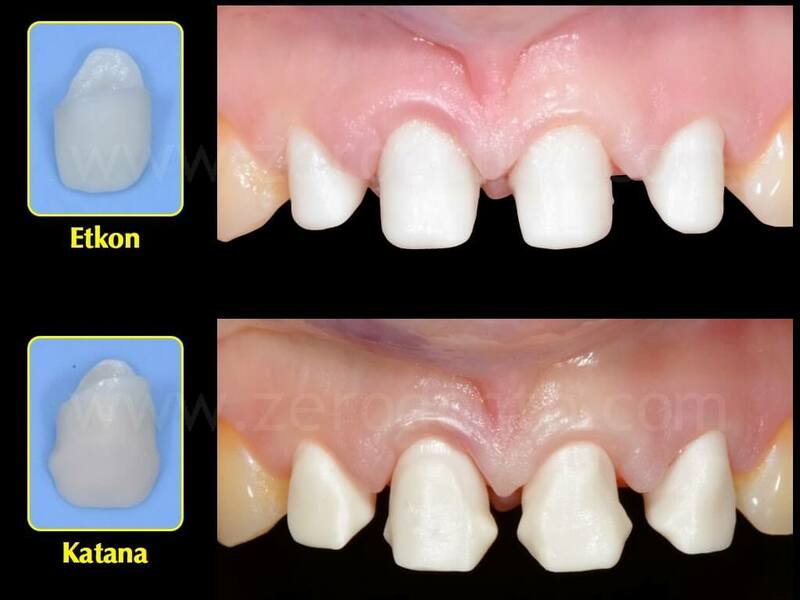 Nonetheless, all the values recorded on the all ceramic restorations were comparable to the clinically acceptable values of fit stated by the American Dental Association. 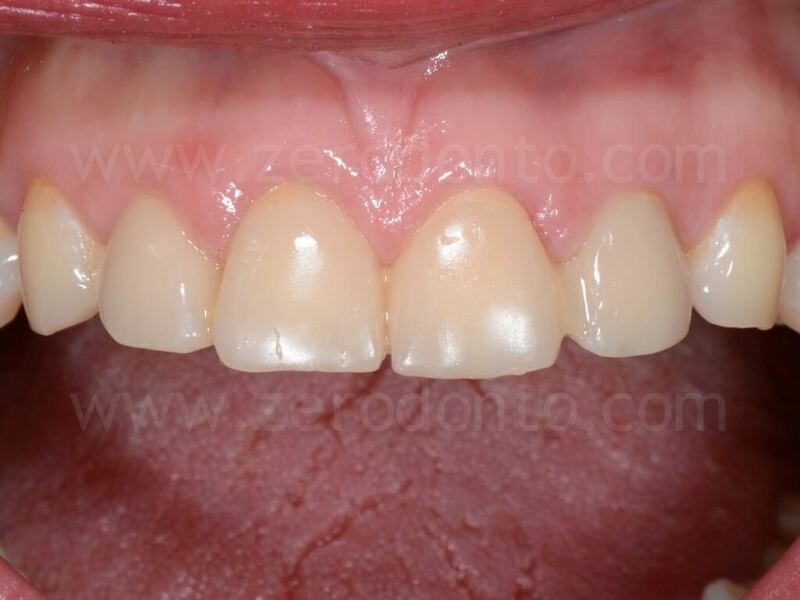 Particularly, the marginal gaps were between 21.1 e 28.4 micron. 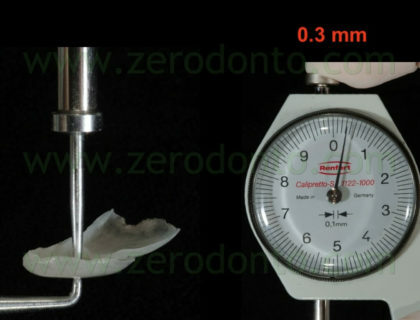 Similarly, the values of internal adaptation were lower in the metal cores; this was probably due to the minimum dimensions of the burs used in CAD-CAM systems to drill the internal surfaces of the all-ceramic cores, determining unsatisfactory values of internal fit at level of the incisal areas (138.8-220-3 micron). 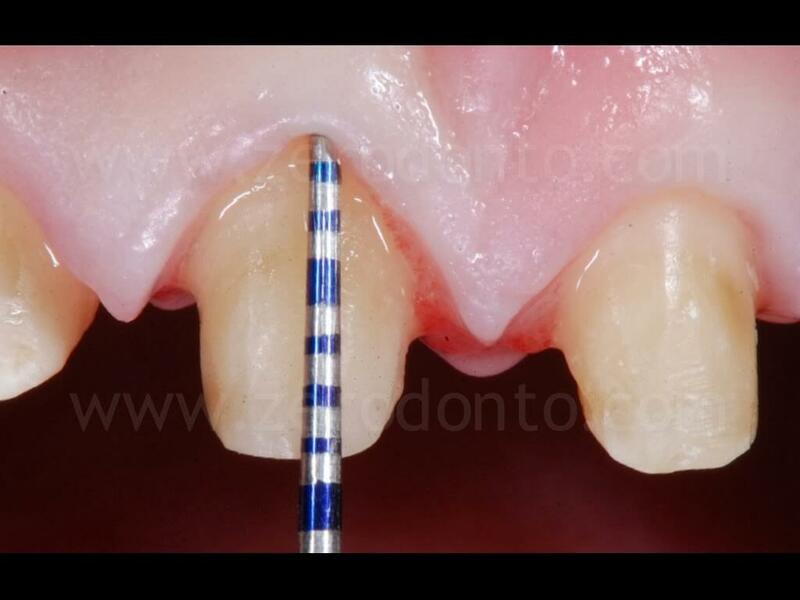 Nonetheless, as reported in literature, these parameters do not affect the clinical reliability of all-ceramic cores. Although with merely speculative purpose because of the limited number of specimens, the marginal and internal values of fit were statistically analyzed by means of univariate ANOVA and Tukey’s post-hoc test (p<0.05). 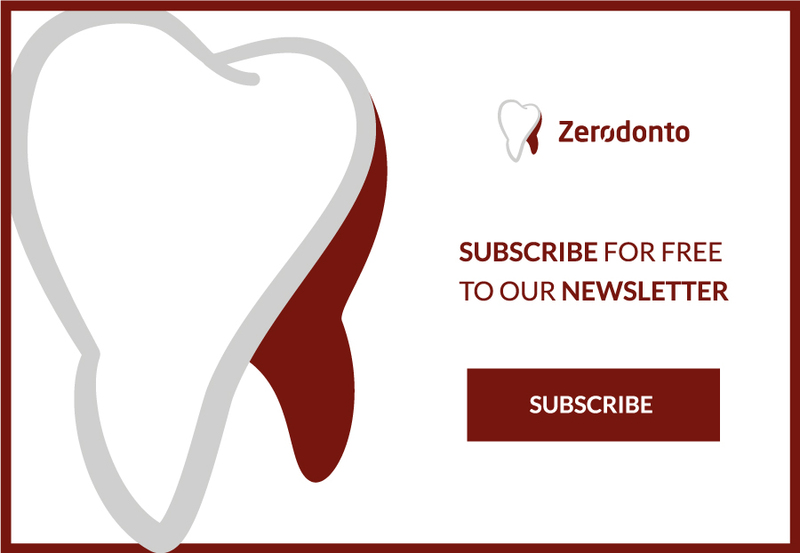 Statistically significant differences were noticed both between the metal and zirconia copings and between the Noritake and Cares zirconia cores.. Furthermore, statistically significant differences were recorded in all measurement points, as shown in the table. 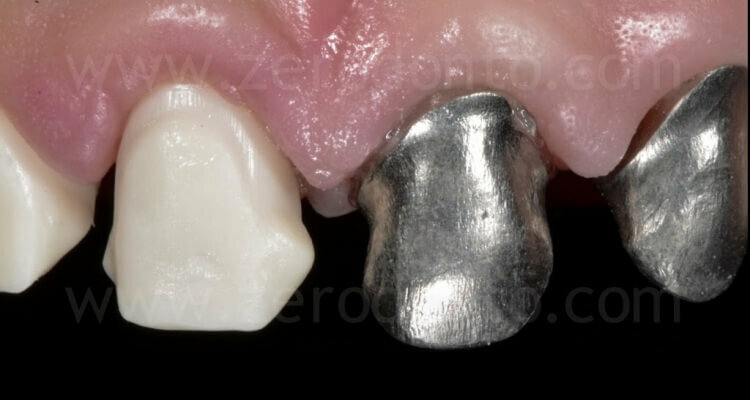 The digital impression technique proved to be reliable in terms of precision and detail reproduction. 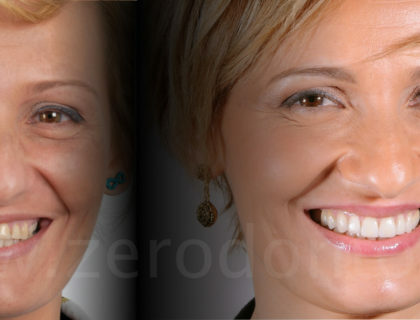 The impression software was very user friendly during both the clinical procedures and the digital prescription phases. Nonetheless, a few drawbacks were evidenced and should be implemented in the future. 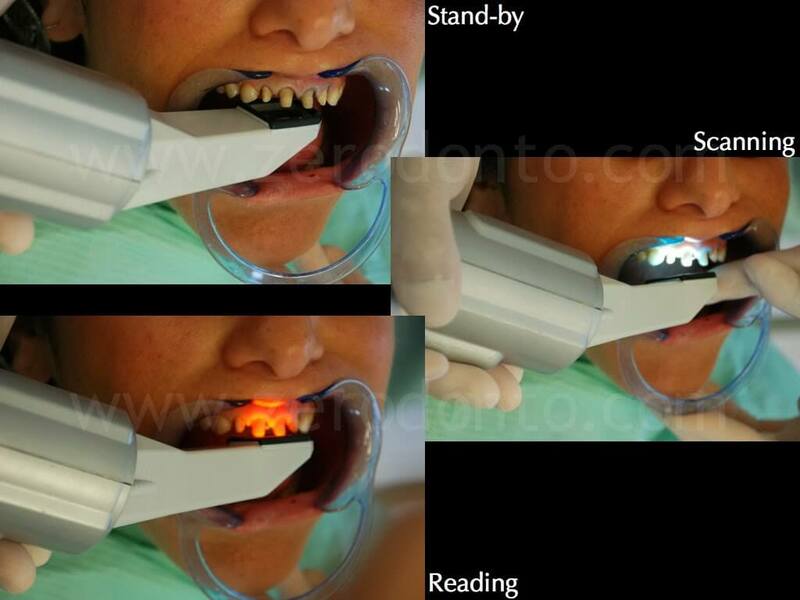 The dimensions of the intraoral scanner were quite big and not very comfortable to reach all intraoral sites; moreover, the weight of the scanner should be reduced in order to make its handling easier. 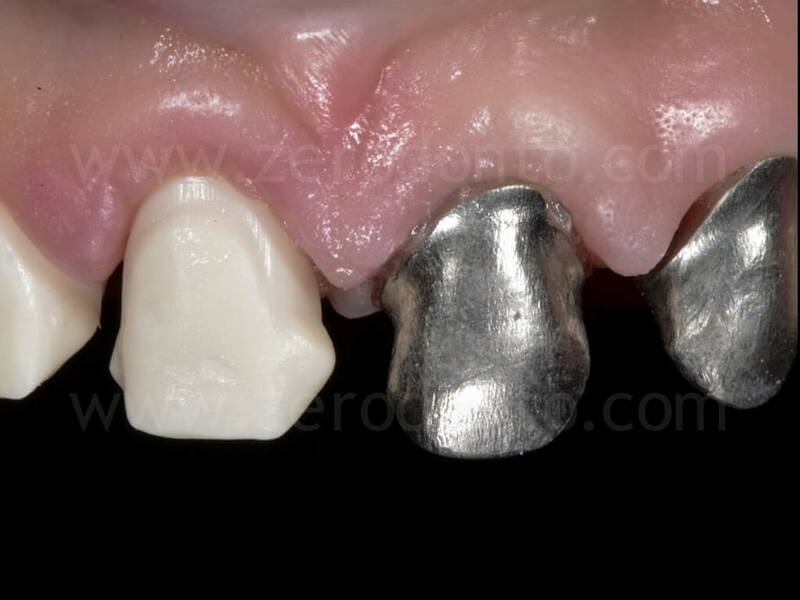 iuxtagingival and intrasulcular areas directly, making the impression even more comfortable for patients and avoiding any operator-sensitive variable in dental impression making. 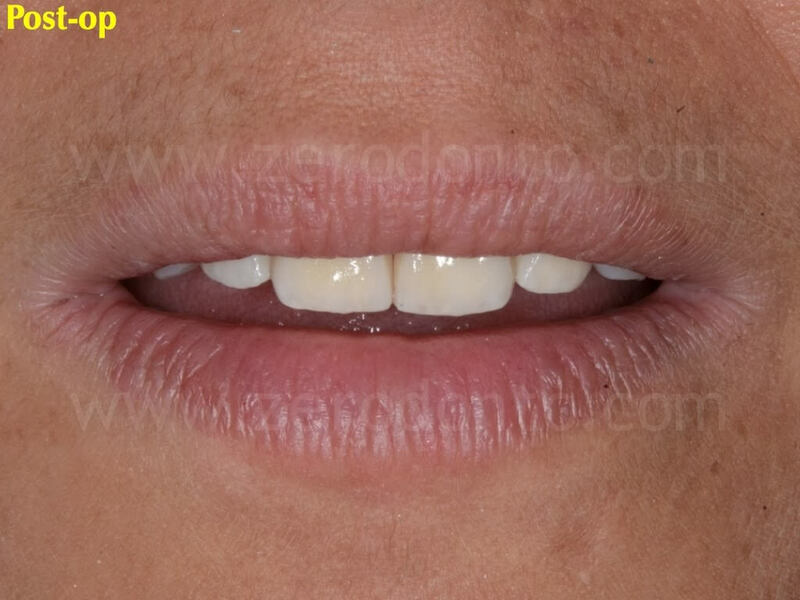 By the way, it is worth noticing that optical impression techniques allow to scan the impression of single abutments at different times, interpolating multiple partial impressions by stitching; although this reduces the discomfort of patients, such a procedure could negatively affect the precision of scanning in transition areas. 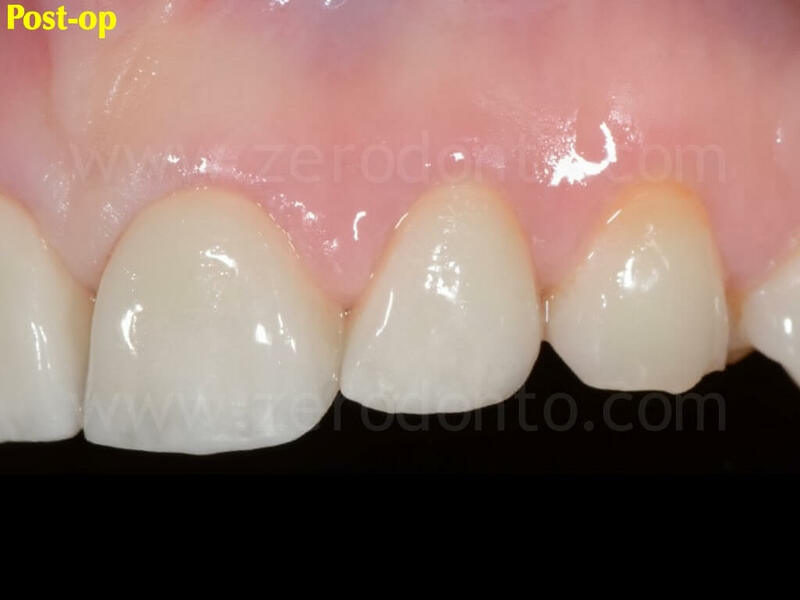 The precision of fit of zirconia copings fabricated using the digital workflow completely satisfied the parameters of marginal precision and internal adaptation reported as clinically valid by scientific literature. 2. 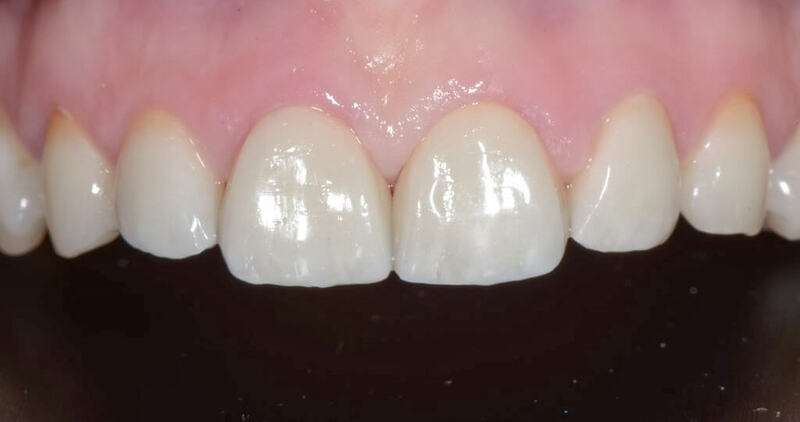 Brawek PK, Wolfart S, Endres L, Kirsten A, Reich S. The clinical accuracy of single crowns exclusively fabricated by digital workflow–the comparison of two systems. 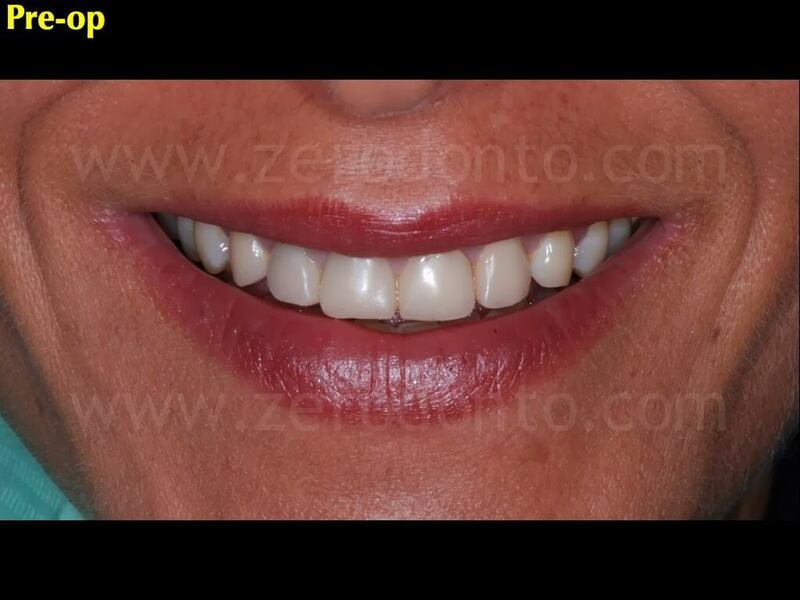 Clin Oral Investig. 2013 Dec;17(9):2119-25. doi: 10.1007/s00784-013-0923-5. Epub 2013 Jan 31. 3. Seelbach P, Brueckel C, Wöstmann B. 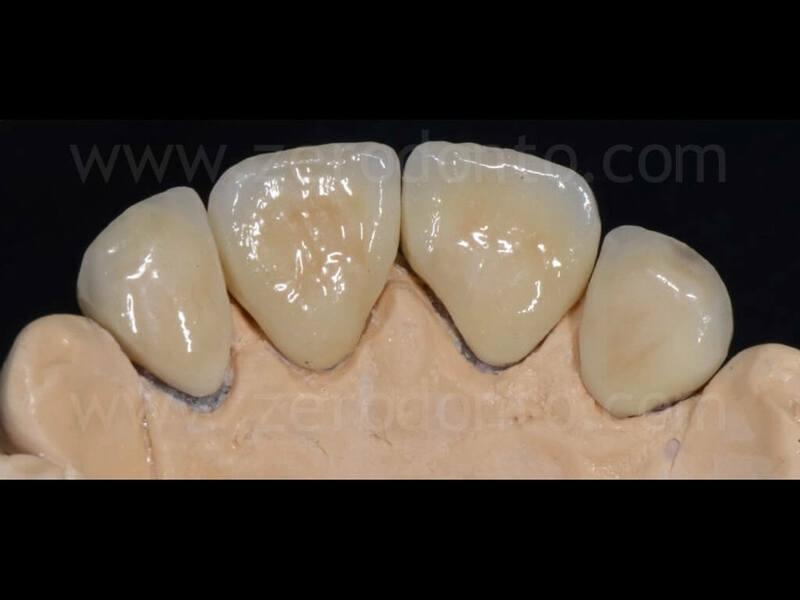 Accuracy of digital and conventional impression techniques and workflow. 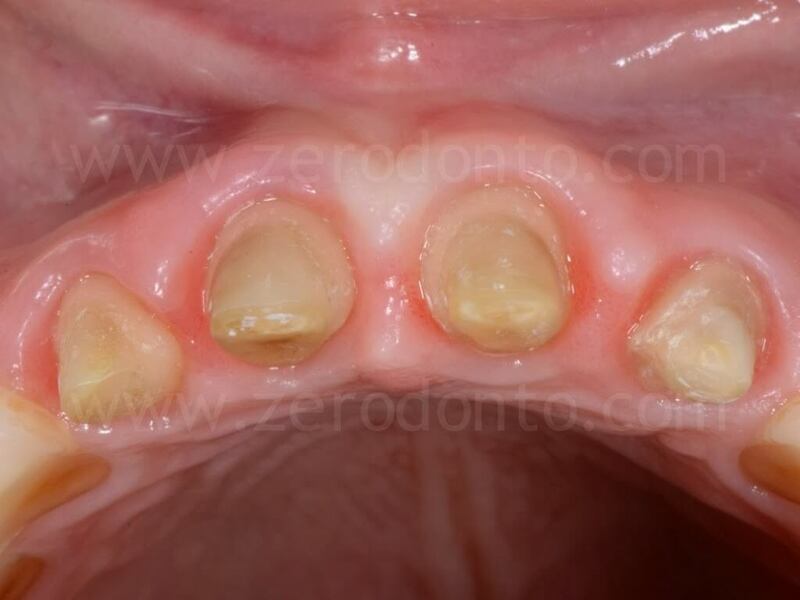 Clin Oral Investig. 2013 Sep;17(7):1759-64. doi: 10.1007/s00784-012-0864-4. Epub 2012 Oct 21. Born in Torre del Greco (Italy) 29 March1987; graduates from high school in 2006 with 90/100. 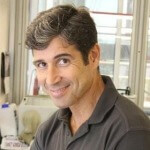 From 2008 to 2012, attends the Dental School at the Federico II University of Naples, being resident in Oral Medicine (directed by Prof. MD. 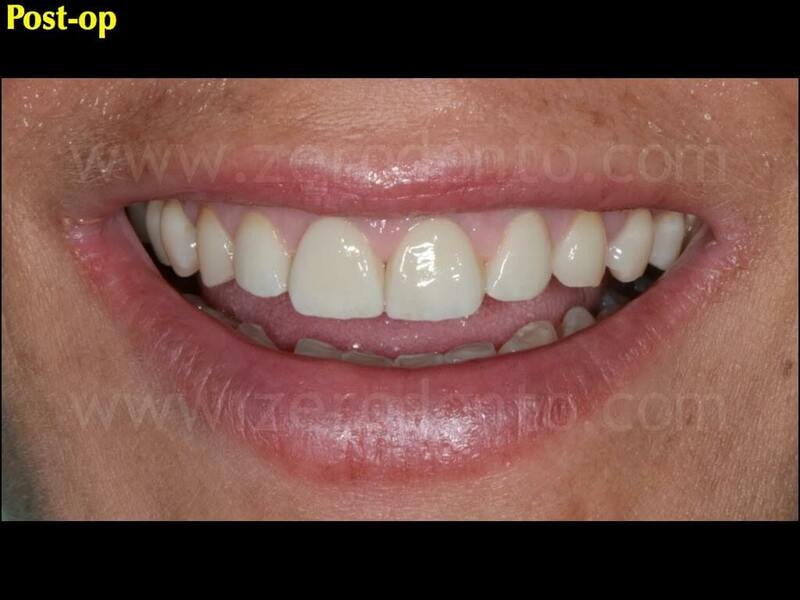 Mignogna), developing clinical skills to diagnose, manage and treat oral lesions and pathologies. Graduates in Dentistry on July 2012 discussing a thesis in Oral Medicine with a final mark of 110/110 with honors and recommendation for publication. 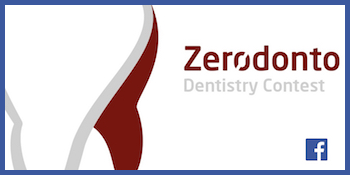 On May 2013, presents his thesis at the 4th World Congress of the International Academy of Oral Oncology (IAOO) with a lecture entitled “Views on the need for continuing education on oral cancer among specialists and generalists: a Delphi survey”. 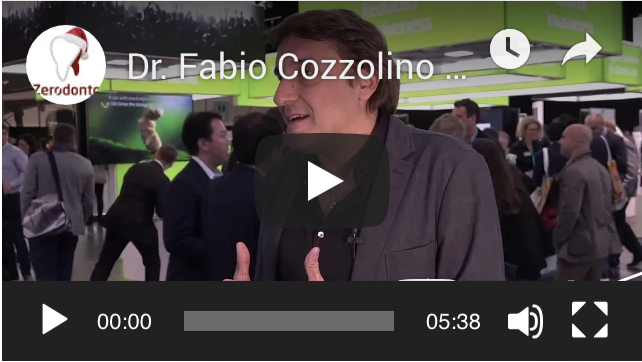 On January 2013, attends an annual course in Advanced Endodontics held by Dr. Flavio Palazzi, developing skills to treat complex cases with the operating microscope.